I have reviewed many desktop 3D scanners and I specifically like them in combination with a turntable. Being able to automate high-quality 3D scanning of small to medium objects is simply a time saver. But until now that automation has always been just partial since most objects require multiple scans from different height angles. That requires the operator to manually rotate the object or adjust the height of the scan head by using a tripod. There are already solutions for completely automating object scanning but they’re usually a combination of an industrial grade handheld scanner (like the $19k Artec Space Spider) on an industrial grade robotic arm. That’s awesome technology but many companies don’t have the budget for either the scanner or the robotic arm. On the other end of the spectrum there’s the $469 Matter and Form desktop 3D scanner — crowdfunded back in 2013 — but that device can only move the scanning head upwards and has a very small turntable so the use cases for professionals are limited. 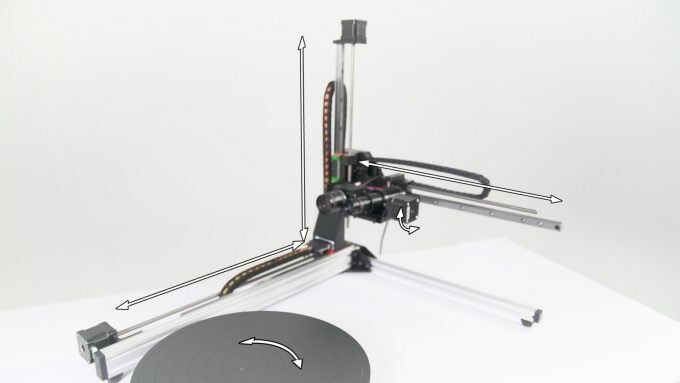 A new 3D desktop scanner on KickStarter, named the D3D-s, aims to resolve this by borrowing some ideas from 3D printers. 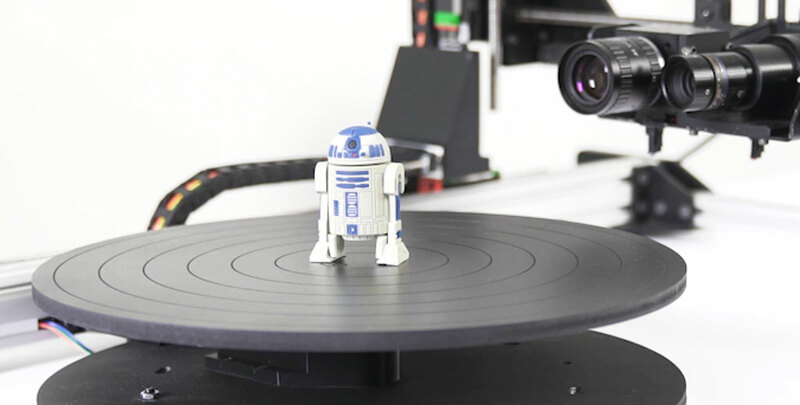 It puts a rotatable scanner head with high-resolution (5 megapixel) camera on rails that can move along 3 axis and also comes with a large turntable. This completely automates 3D object scanning which is great for use cases that require scanning a lot of items a day. And with a diameter of 300mm the turntable is a lot larger than competing systems so it can scan larger objects automatically up to a height of 330mm. You can also scan larger objects (370x330x350mm) without the turntable. Another area where many desktop 3D scanners fall short is capturing color. Most scanners come with relatively low-resolution monochrome cameras while the D3D-s includes a 5MP color camera. And on top of that this camera includes an array of diffuse white LED’s to illuminate the object during color capture — a feature that until now is only present on high-end handheld scanner like EinScan-Pro and Artec Eva. I strongly believe that color capture is becoming increasingly important for 3D scanning now that use-cases are moving far beyond measurement-only purposes like (reverse) engineering. For me the resolution and accuracy of the textures are becoming as important as the geometric quality of the 3D scans. The complete package will be available for $2999. However, during the KickStarter campaign this price has been reduced to $2499. That’s a very competitive price point which makes you wonder if there are any downsides to this approach. While I can only really say something about it after I’ve tested I’m curious about how fast this scanner is. In general, scanning with a single line is a lot slower than pattern-based structured light scanning. It’s probably faster at lower resolutions, but the speed metric is interestingly absent in the comparison table to other scanners. After watching the video, I’m also a bit concerned about the sounds the D3D-s will produce while scanning. I have a filament-based 3D printer at the office that I almost never use during work hours because of the constant noises the motors produce. Before I started reviewing 3D scanners, I actually reviewed many of these type of 3D printers and came to the conclusion that to be worthy of being called a “desktop” 3D printer it should be able to function comfortable on a desk — or even in the same office. I believe the same is true for anything else that’s designed to operate in a non-industrial environment. Besides the hardware I’m also curious about the software that comes with the D3D-s, since in my opinion this accounts for 50% of the user experience and is something a early-adopters of new 3D scanning solutions should consider. Looking forward to test this scanner when it’s out! First deliveries are expected as soon as June 2018 but from my experience with other 3D scanners on KickStarter (I just previewed the Eora 3D smartphone-based laser scanner which was kickstarted in 2016 and is still in beta) I’ll have to see it to believe it. Follow me on your favorite social network if you want to be the first to know when I’ll review the D3D-s. Also, I’d really appreciate it if you share this post with you friends and followers!